The idea that California was an island arose in 1602 in reports by Fr. Antonio de la Ascension, and was picked up by map makers in London and Amsterdam. The myth was dispelled in 1701 by Fr. Eusebio Kino, but erroneous maps continued to be issued until late in the 18th century. 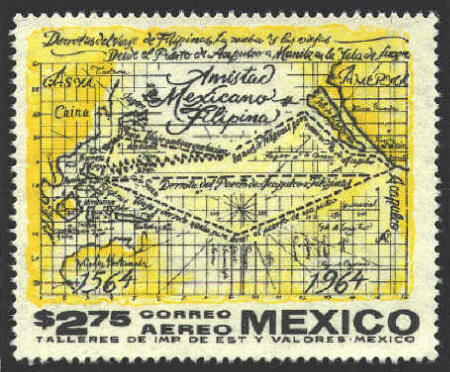 On the high value of a set of stamps issued by Mexico to commemorate the 400th anniversary of the first ship to make a round trip from Mexico to the Philippines, the map shows California as an island. Although the voyage commemorated by the stamp occurred before the island-California myth arose, the error could be described as an error of source.